People living in Bellingham have a pretty forgiving attitude toward the trains that rumble through town. The shrill whistles, the squealing wheels, the crossing delays—they’re all part of life in this laid-back college community. But something new is roaring down the tracks and it has the city’s full attention. About 800 people packed a recent meeting in Bellingham High School’s theater to learn more about the proposed $700 million Gateway Pacific Terminal, which would be situated within the Cherry Point Aquatic Reserve on the Strait of Georgia, about 15 miles northwest of downtown Bellingham and 10 miles from the Canadian border. There are already three industrial sites in this area just west of Ferndale: two oil refineries and an aluminum smelter. 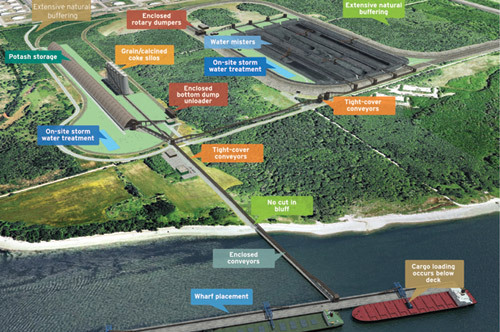 The fourth and final component in Whatcom County’s master plan for the site would ship millions of tons of coal from the Powder River Basin of Montana and Wyoming to China and other Asian countries. It would also have the capacity to handle wheat, potash and other dry bulk commodities. Supporters herald the expected $140 million annual economic impact of the terminal, including payroll and tax revenues, the efficiency of using large “Capesize” vessels—the largest dry bulk carriers available—and the thousands of well-paying jobs it would create. Seattle-based SSA Marine, the largest terminal operator in the country, estimates the project would create 4,400 jobs during construction and 1,250 jobs long term. SSA Marine has entered into an agreement with St. Louis-based Peabody Energy, the largest coal company in the world, to export as much as 24 million metric tons of coal per year through the proposed terminal. Opponents say increased train traffic and coal dust from the terminal will affect the health, safety and quality of life of Bellingham residents. They also worry that water quality and herring spawning grounds within the aquatic reserve will be harmed by coal dust, storm water runoff and possible fuel spills. Too, the area could be put at risk for a possible oil spill caused by vessel collisions or groundings. Those family-wage blue-collar jobs are hard to come by in Whatcom County, where the cost of living approaches Seattle’s but average wages are 20 percent lower, Oplinger notes. Much of the perceived effect in Bellingham would come from the estimated nine round trips of coal trains added to the three or four that currently pass through the city daily. Each train would have at least 125 cars, extending a mile and a half. That’s too much for some residents. 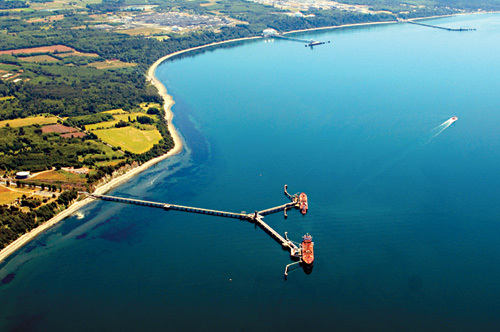 Krogh and other opponents point to stories of coal dust drifting from the Westshore Terminals site in Roberts Bank, British Columbia, near the BC Ferries Tsawwassen terminal, and then settling on boats and cars in nearby Point Roberts, Washington. Political leaders are also waiting to see where things go. Karina Shagren, a spokesperson for Governor Christine Gregoire, says the governor “is aware of the economic benefits, but she wants to see the regulatory process play out before she takes a position.” U.S. Representative Rick Larsen, whose congressional district encompasses Whatcom County and the proposed terminal site until redistricting takes effect next year, supports the project because of the jobs it will create. But Larsen urges citizens to express their concerns through the “scoping” process playing out this summer. That process is sure to be hotly debated. Krogh argues for a regional scope, pointing to impacts of increased train traffic from Spokane, all along the Columbia River valley, and through Seattle. “This will have real impacts on the entire state,” he argues. In May, the Seattle City Council, which ultimately has no say in the matter, unanimously passed a resolution opposing the development of coal export terminals in the state, citing concerns about increased train traffic and possible adverse impacts on public health and the environment. 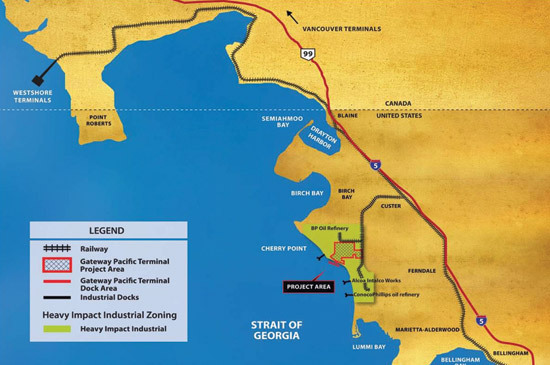 Besides the Gateway Pacific Terminal, at least five other projects have been proposed in Washington and Oregon. Trains traveling to the Gateway Pacific Terminal would be routed through Seattle because a more logical northerly route across Stevens Pass presents too steep a grade for the fully loaded trains.